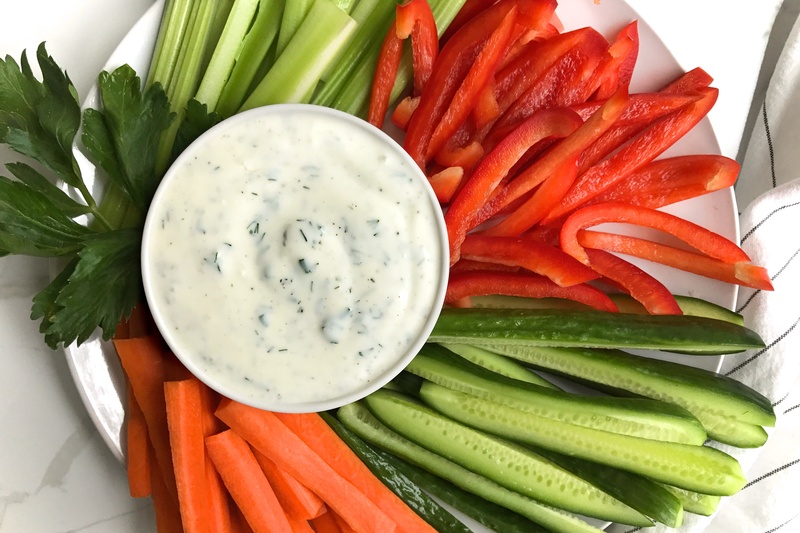 Ranch dip used to be my all-time favourite as a kid. In fact, it was one of the only salad dressings I’d eat. Of course, it was the commercially-processed, junky kind filled with trans fats and chemical flavours…but man, did it taste good to me back then. I, obviously, don’t turn to Hidden Valley for my ranch cravings any longer. 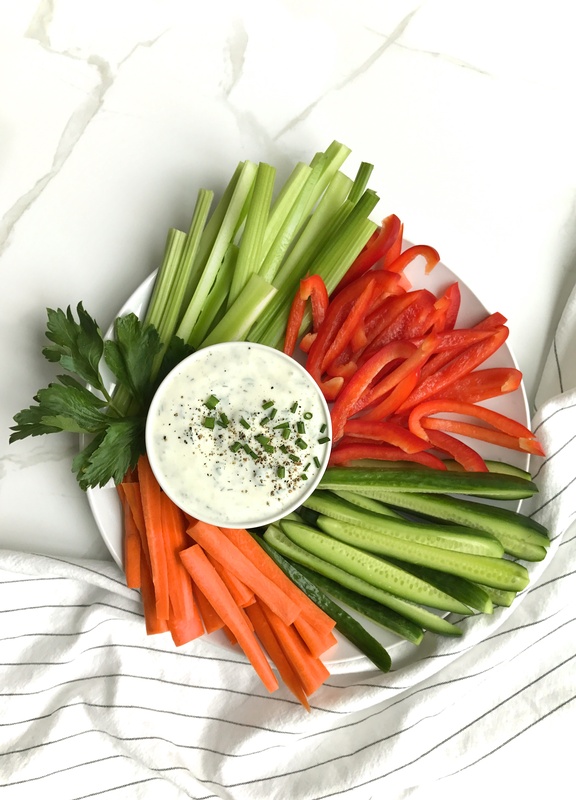 So, I wanted to share this super simple Kefir Ranch Dip recipe with you because it’s quick, delicious AND uber-nutritious. The only step that you need to wait for is straining the kefir to make it thicker. This requires about half hour, but you don’t need to monitor anything. So, you can strain while you watch your favourite episode of Grace and Frankie and then make the rest in 2, hot, seconds. I’ve used both this nut milk bag in a sieve and a coffee filter in a sieve. Cheesecloth works in there too! 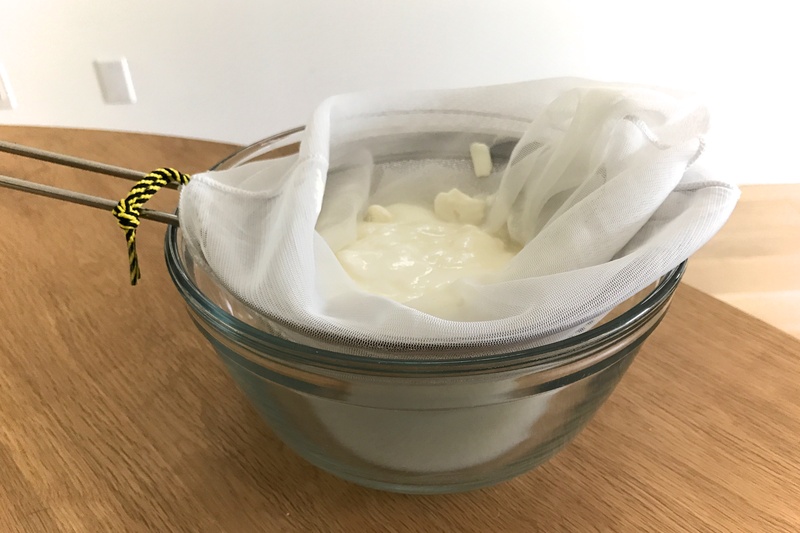 Yes, you could easily make this with a good-quality yogurt to avoid the straining step, but using kefir gives it that added nutritional punch of increased probiotics. If you’ve read my Fermented Foods FAQ, you’ll know why kefir is a superior dairy product. But, yogurt ain’t too shabby either (if you do dairy). Just make sure to look for plain yogurt with “live and active” cultures from a trusted, organic source. You can get non-dairy yogurt and coconut milk kefir too! You will be surprised by how easy this is. This dip is great with veggie crudités, on sandwiches, mixed into a veggie or whole grain salad…and makes a perfect potato companion. Can’t wait for you to try it! Strain kefir at least 30 minutes to create a thicker consistency like yogurt. (Simply, pour into cheesecloth or coffee filter placed in a mesh strainer above a bowl. The liquid will drop to the bottom of the bowl.) When kefir is desired consistency, dump it into a small mixing bowl. Add crushed garlic, chopped herbs, dill/sauerkraut brine (or lemon juice), salt and pepper into kefir and whisk together until evenly combined. Store in a resealable glass jar in the fridge up to a week. To find out more about my thoughts on choosing optimal animal products like dairy and eggs, make sure to check out my ebook Fresh Start Kitchen! I love seeing your healthy creations, so if you make this Kefir Ranch Dip, snap a pic and tag me on social so I can see how it turned out! I’m @kimdeoncom.